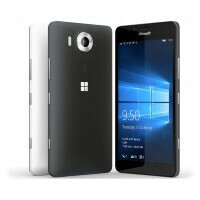 The Microsoft Lumia 950, Microsoft Lumia 950 XL and Microsoft Lumia 550 were introduced earlier this month. Now, there is talk about a mid-range Microsoft Lumia 650 model that will also launch with Windows 10 Mobile inside. Besides having the latest build of Microsoft's mobile OS, all four of these phones are expected to feature new ring tones, alarm tones and notification tones. All of the new tones can be heard on this one YouTube video that also mentions the name of each one. This way, when you find a tone that you like, you can scribble down the name and use it when you buy one of the new Lumia models. Among the names of these new tones are: Ahead of time, Air Display, Alablaster, Americano, Appointment, Archipelago, Ball, Beep Alarm, Bird Box, Bird, Birds in the Woods, Bouncey Bounce, Breeze, Brikabrak, Brimful, Bubbles, Candy, Cat, Clokktastrophe, Concierge, Diamond, Digital Friend, Early Chill, Early, Easy for You, Epic Day, Exoplanet, Friendship, Glass, Glaze, GoodTimes, Hazel, Horizon, Hybrid, Ice, Kantele, Knock, Lucky Five, Lumia Calendar, Lumia Clock, Lumia Email, Lumia Message, Lumia Voicemail, Marbles, Mbira, Microsoft Ringtone, Miniature of Troy, Minutes, Nana, Neo, Nostalgia, On the Bridge, Pear, Pebble, Pouch, Reservation, Riverbank Dawn, Sauna, Shimmering, Silver, Skate, Slow Coffee, Summer Fruit, That Girl from Copenhagen, The Shakes, Tomorrow, Torchbearer, Two Cats, Universe and Waterways. Some of these tones consist of one note, while others are quite longer. Some are self explanatory (Cats, Two Cats), while others (Clokktastrophe) don't sound like their title. One tone (That Girl from Copenhagen) is a satire of a real song. It will be up to you to determine which tones you will use on your new Lumia handset. Listen to the entire set of notification tones, alarm tones and ring tones by clicking on the video below. please Verizon get the 950 because you have no windows smart phone as good as your Nokia Lumia 928 that you no longer sell on your network. Please 7thspaceman , tell that to Verizon, not PA. Please FrankUnderwood2.... Umm, I have nothing to say at all. This is a waste of a comment. I wasted your time writing this. You're asking the desert for water here. Just switch to at&t, same/better coverage and better phone selection. You should be able to buy it unlocked from Microsoft. I'm pretty sure it will cover the bands required to use on the Verizon network, but best to double check any phone before purchasing.